Hello Kitty will swallow your soul! 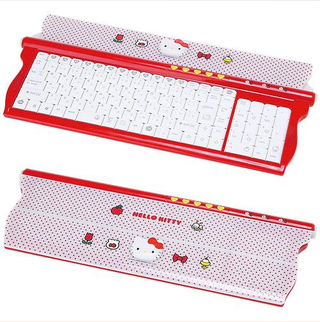 And now that we have that out of the way, we can take a look at this incredibly loud looking Hello Kitty keyboard, which will also, incidentally, swallow souls. Normally, we'd call a $106 keyboard that boasts no significant features—aside from deadly cuteness and the ability to make grown men say "No, seriously, this is for my kid sister, honest" on command—a ripoff, but since this cat would skin us alive, we'll stay quiet. Goes well with this, which is also pink, and therefore adorable.